The diagnosis of cystinuria is readily made by stone analysis, microscopic examination of the urine, and 24-hour urine testing. Although surgical intervention is necessary, the cornerstones of treatment are dietary and medical prevention of recurrent stone formation. For patient education information, see Kidney Stones. High-affinity system: This system is affected in persons with cystinuria. The high-affinity system mediates uptake of 10% of L-cystine and the dibasic amino acids at the apical membrane of the straight third segment (S3) of the proximal tubule. Low-affinity system: This system is present in the S1-S2 part of the proximal tubule and is responsible for 90% of L-cystine reabsorption. The low-affinity process augments the high-affinity process. After absorption, each molecule of cystine is intracellularly converted to 2 molecules of cysteine. Cysteine exits at the basolateral membrane. The high-affinity transporter is present in the apical brush-border membrane of the jejunum and is responsible for absorption of cystine and dibasic amino acids. Most patients with cystinuria have impaired absorption of cystine; however, cystine deficiency is not clinically significant because absorption of short-chain amino acids is not affected. Normally, cystine and the other dibasic amino acids (ie, ornithine, lysine, arginine) are filtered at the glomerulus and reabsorbed in the proximal convoluted tubule by a high-affinity luminal transmembrane channel. Defects in this channel cause elevated levels of dibasic amino acid secretion in the urine. Whereas ornithine, lysine, and arginine are completely soluble, cystine is relatively insoluble at physiologic urine pH levels of 5-7, with a pKa level of 8.3. At a urine pH level of 7.8 and 8, the respective solubility of cystine is nearly doubled and tripled. Dent and Senior demonstrated that the solubility of cystine is pH-dependent. 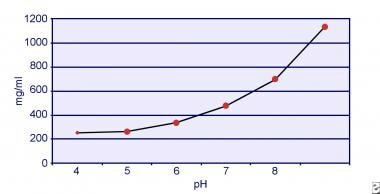 The solubility of cystine in urine is approximately 250 mg/L (1 mmol/L) up to a pH level of 7, but solubility increases with a higher pH level by up to 500 mg/L (2 mmol/L) or more above a pH level of 7.5, as depicted in the image below. Measurements in urine have clearly shown that cystine solubility increases linearly with increased ionic strength. Pak and colleagues showed that approximately 70 mg of additional cystine can be dissolved in each liter of solution, with an increase in ionic strength from 0.005-0.3. In addition, at the same ionic strength and pH, cystine solubility varies depending on the particular type of electrolyte present. See the image below. In vitro experiments by Pak and Fuller in 1983 revealed that the highest solubility is accomplished in the presence of calcium chloride, followed by magnesium and sodium chloride. Furthermore, cystine solubility is also affected by urinary macromolecules. The presence of colloid in normal urine has been shown to increase cystine solubility; however, the mechanism of this action is not clear. Because nothing inhibits cystine crystallization, the main determinant is urinary supersaturation. Heterogeneous nucleation of calcium oxalate, brushite, or hydroxyapatite does not occur in individuals with cystinuria. Risk factors for cystine crystallization include (1) low pH level, (2) reduced ion strength, (3) the presence of cystine crystals, and (4) low levels of urinary macromolecules. Two thirds of persons with cystinuria who form stones make pure cystine calculi, and one third have a mixture of cystine and calcium oxalate calculi. In 2002, Martins et al reported that calcium oxalate precipitation occurs by a salting-out process, ie, the reduction in solubility of a substance due to the addition of another substance to the system, rather than by the process of heterogenous nucleation. Hypocitraturia, hypercalciuria, and hyperuricosuria are also frequently associated with cystinuria. Given their relatively uniform crystalline structure without lamellated cleavage planes, pure cystine calculi are among the hardest on Dretler's stone fragility index. Cystinuria is an autosomal-recessive disease divided into 3 subtypes: Rosenberg I, II, and III. Cystinuria type I is the most common variant and has been mapped to band 2p16.3. Type I heterozygotes show normal aminoaciduria. Classic cystinuria, types II and III, were thought to be allelic variants, but linkage analyses have revealed type III to be a defect of an uncharacterized gene (SLC7A9) on band 19q13.1. Heterozygotes of types II and III often manifest cystinuria without cystine calculi and may be at increased risk for other types of urolithiasis. Type I heterozygotes are distinguished by normal levels of urinary cystine. To classify cystinuria clinically, urinary cystine can be measured in each parent of a proband as phenotype I (recessive, urinary cystine level < 100 µmol/g of creatinine), phenotype II (dominant, urinary cystine level >1000 µmol/g of creatinine), and phenotype III (partially dominant, urinary cystine level 100-1000 µmol/g of creatinine). Cystinuria can also be classified based on the age at which symptoms first appear (ie, infantile, juvenile, adolescent). In healthy individuals, the upper limit for cystine excretion is 20 mg/g of creatinine (< 10 µmol/mmol of creatinine). Homozygotes excrete more than 400 mg/d (1.7 mmol/d), and cystine excretion in homozygous patients is usually 600-1400 mg/d (2.5-5.8 mmol/d). Heterozygotes with type I and III cystinuria excrete less than 200 mg/d (0.8 mmol/d) and do not form stones. Type II heterozygotes excrete up to 200-400 mg/d, but these patients may form stones. The incidence of stone formation increases when urinary cystine concentration exceeds 700 µmol/L (170 mg/L). In recent years, with the advancements in molecular biology, new insights have accumulated regarding the pathophysiology of cystinuria. In 1992, several investigators reported the expression cloning of a 2.3-kilobase renal cDNA (D2H or rBAT) that induced sodium-independent uptake of cystine and the dibasic amino acids in cRNA-injected Xenopus laevis oocytes. The rBAT gene was mapped to chromosome 2 (band 2p21) between D2S119 and D2S288. This gene is now named SLC3A1 in the Genome Database. Immunohistochemical and in situ hybridization studies revealed that rBAT is expressed in cells of the S3 (pars recta) segment of the proximal tubule and small intestine at the luminal brush-border membrane. In 1995, Gasparini et al reported that mutations in SLC3A1 occurred in patients with type I cystinuria and not in patients with type II or III cystinuria. To date, more than 160 different mutations have been described, including both small and large deletions of DNA base pairs from the gene. One of the most common genetic alterations in SLC3A1 is called M467T, and most mutations tend to be population-specific. The M467T mutation is fairly common in Mediterranean populations. Interestingly, it accounted for 40% of mutations in a Spanish cohort of families and was rare in patients studied in Quebec, Canada. In 1999, the SLC7A9 (BAT1) gene was isolated. The gene encodes a 487–amino acid protein and was mapped to chromosome 19 (band 19q13) between D19S414 and D19S220. The BAT1 product appears to be a membrane protein with 12 membrane-spanning regions. Mutations in the BAT1 gene probably cause non–type I cystinuria (Rosenberg type II and III). Mutations at the 19q locus are especially common among Libyan Jews, and the risk of urolithiasis in patients who inherit 2 such 19q locus mutations is roughly comparable to that in patients who inherit 2 rBAT mutations. 116 mutations in this gene have been reported. The most common mutation in Libyan Jews resulted in a methionine replacing the valine amino acid residue (V170M) in the protein. In heterozygotes with the V170M mutation, urinary cystine concentrations range from 86-1238 µmol/g of creatinine. Thus, some of the values in V170M heterozygotes are consistent with type III cystinuria and others with type II cystinuria. Type A, mutation of both alleles of SLC3A1: Heterozygotes show a normal amino acid urinary pattern. Type B, mutation of both alleles of SLC7A9: Heterozygotes usually show an increase of cystine and dibasic amino acid urinary excretion. Type AB, cystinuria caused by 1 mutation in SLC3A1 and 1 mutation in SLC7A9: Mixed-type cystinuria may be caused by the interaction of 2 distinct mutant genes, and the protein encoded by the 19q gene directly interacts with rBAT in the S3 segment of the proximal tubule (see the Table). Recent evidence suggests that the 4F2HC/4F2LC complex accounts for the Y+L amino acid transport system at the basolateral surface of intestinal and renal proximal tubular cells and that the mutations of the 4F2LC gene (SLC7A7) on band 14q11-13 cause the rare recessive disease called lysine-protein intolerance. Type III and II cystinuria (non–type I) have been linked to band 19p13.1 (SLC7A9); however, further studies are needed to determine the exact role of the SLC7A9 gene. Approximately 50% of children with 2 SLC3A1 mutations (classic homozygous type I cystinuria) develop at least one stone within the first decade of life. Cystinuria is an autosomal-recessive disease. Two genes have been implicated, both of which code for proteins involved in the transport of neutral and basic amino acids: SLC3A1 codes for rBAT; and SLC7A9 codes for and b0,+AT. The genetic defect impairs intestinal absorption and renal reabsorption of cystine, causing elevated urinary levels of cystine and subsequent crystallization and stone formation. Worldwide, the overall prevalence is 1 person per 7000 population but varies significantly by population. Prevalences of cystinuria are 1 case in 18,000 in Japan, 1 case in 2500 in Israel, 1 case in 2000 in Great Britain, 1 case in 4000 in Australia, 1 case in 1900 in Spain, 1 case in 2500 in Libyan Jews, 1 case in 100,000 in Sweden, 4.5 in 100,000 in Saudi Arabia  . The Quebec Genetic Network Neonatal Screening Program reported the incidence of persistent cystinuria as 562 cases per million infants, a rate 7 times higher than for clinically manifested cystinuria in the adult population of Quebec. This suggests that many cystinuric individuals do not form stones. Cystinuria is an inherited metabolic disorder; therefore, patient education is extremely important. The children of parents who both have cystinuria have a 100% chance of becoming cystinuric. If one parent is fully cystinuric and the other is a carrier, the chance of each child becoming fully cystinuric is 50%. If both parents are carriers, the chance of each child becoming cystinuric is 25%. If one parent is cystinuric and the other is neither cystinuric nor a carrier, the chance of each child becoming cystinuric is nil. Leslie SW, Nazzal L. Renal Calculi (Cystinuria, Cystine Stones). 2017 Jun. [Medline]. [Full Text]. Barbey F, Joly D, Rieu P, et al. Medical treatment of cystinuria: critical reappraisal of long-term results. J Urol. 2000 May. 163(5):1419-23. [Medline]. Wollaston WH. On cystic oxide. A new species of urinary calculus. Trans R Soc London. 1810. 100:223-30. Berzellius J. Calculus urinaires. Traite Chem. 1833. 7:424. Garrod AE. Inborn errors of metabolism. Lancet. 1908. 2:1, 73, 142, 214. Yeh HL, Frankl W, Dunn MS. The urinary excretion of amino acids by cystinuric subjects. Am J Med Sci. 1974. 214:507-12. Dent CC, Rose GA. Amino acid metabolism in cystinuria. Q J Med New Series. 1974. 214:507-12. Harris H, Mittwoch U, Robson EB, Warren FL. Phenotypes and genotypes in cystinuria. Ann Hum Genet. 1955 Aug. 20(1):57-91. [Medline]. Milne MD, Asatoor AM, Edwards KD, Loughridge LW. The intestinal absorption defect in cystinuria. Gut. 1961 Dec. 2(4):323-37. [Medline]. Tabachnick M, Eisen HN, Levine B. A new mixed disulphide: penicillamine-cysteine. Nature. 1954 Oct 9. 174(4432):701-2. [Medline]. Crawhall JC, Scowen EF, Watts RW. Effect of penicillamine on cystinuria. Br Med J. 1963 Mar 2. 5330:588-90. [Medline]. Lee WS, Wells RG, Sabbag RV, et al. Cloning and chromosomal localization of a human kidney cDNA involved in cystine, dibasic, and neutral amino acid transport. J Clin Invest. 1993 May. 91(5):1959-63. [Medline]. Bisceglia L, Calonge MJ, Totaro A, et al. Localization, by linkage analysis, of the cystinuria type III gene to chromosome 19q13.1. Am J Hum Genet. 1997 Mar. 60(3):611-6. [Medline]. Markazi S, Kheirollahi M, Doosti A, Mohammadi M, Koulivand L. A Novel Mutation in SLC3A1 Gene in Patients With Cystinuria. Iran J Kidney Dis. 2016 Jan. 10 (1):44-7. [Medline]. Chillarón J, Font-Llitjós M, Fort J, Zorzano A, Goldfarb DS, Nunes V, et al. Pathophysiology and treatment of cystinuria. Nat Rev Nephrol. 2010 Jul. 6(7):424-34. [Medline]. Dent CE, Senior B. Studies on the treatment of cystinuria. Br J Urol. 1955 Dec. 27(4):317-32. [Medline]. Pak CY, Fuller C, Sakhaee K, et al. Management of cystine nephrolithiasis with alpha- mercaptopropionylglycine. J Urol. 1986 Nov. 136(5):1003-8. [Medline]. Pak CY, Fuller CJ. Assessment of cystine solubility in urine and of heterogeneous nucleation. J Urol. 1983 May. 129(5):1066-70. [Medline]. Martins MC, Meyers AA, Whalley NA, Rodgers AL. Cystine: a promoter of the growth and aggregation of calcium oxalate crystals in normal undiluted human urine. J Urol. 2002 Jan. 167(1):317-21. [Medline]. Gasparini P, Calonge MJ, Bisceglia L, et al. Molecular genetics of cystinuria: identification of four new mutations and seven polymorphisms, and evidence for genetic heterogeneity. Am J Hum Genet. 1995 Oct. 57(4):781-8. [Medline]. Andreassen KH, Pedersen KV, Osther SS, Jung HU, Lildal SK, Osther PJ. How should patients with cystine stone disease be evaluated and treated in the twenty-first century?. Urolithiasis. 2016 Feb. 44 (1):65-76. [Medline]. Pras E. Cystinuria at the turn of the millennium: clinical aspects and new molecular developments. Mol Urol. 2000 Winter. 4(4):409-14. [Medline]. Dello Strologo L, Pras E, Pontesilli C, et al. Comparison between SLC3A1 and SLC7A9 cystinuria patients and carriers: a need for a new classification. J Am Soc Nephrol. 2002 Oct. 13(10):2547-53. [Medline]. Martens K, Jaeken J, Matthijs G, Creemers JW. Multi-system disorder syndromes associated with cystinuria type I. Curr Mol Med. 2008 Sep. 8(6):544-50. [Medline]. Rosenberg LE, Downing S, Durant JL, Segal S. Cystinuria: biochemical evidence for three genetically distinct diseases. J Clin Invest. 1966 Mar. 45(3):365-71. [Medline]. Gaildrat P, Lebbah S, Tebani A, Sudrié-Arnaud B, Tostivint I, Bollee G, et al. Clinical and molecular characterization of cystinuria in a French cohort: relevance of assessing large-scale rearrangements and splicing variants. Mol Genet Genomic Med. 2017 Jul. 5 (4):373-389. [Medline]. [Full Text]. Goldstein B, Goldfarb DS. Early Recognition and Management of Rare Kidney Stone Disorders. Urol Nurs. 2017 Mar-Apr. 37 (2):81-9, 102. [Medline]. [Full Text]. Fazaeli S, Ashouri S, Kheirollahi M, Mohammadi M, Fazilati M. A Novel Mutation in SLC7A9 Gene in Cystinuria. Iran J Kidney Dis. 2017 Mar. 11 (2):138-141. [Medline]. [Full Text]. Obaid A, Nashabat M, Al Fakeeh K, Al Qahtani AT, Alfadhel M. Delineation of cystinuria in Saudi Arabia: A case series. BMC Nephrol. 2017 Feb 6. 18 (1):50. [Medline]. [Full Text]. Chow GK, Streem SB. Contemporary urological intervention for cystinuric patients: immediate and long-term impact and implications. J Urol. 1998 Aug. 160(2):341-4; discussion 344-5. [Medline]. Lindell A, Denneberg T, Granerus G. Studies on renal function in patients with cystinuria. Nephron. 1997. 77(1):76-85. [Medline]. Prot-Bertoye C, Lebbah S, Daudon M, et al. CKD and Its Risk Factors among Patients with Cystinuria. Clin J Am Soc Nephrol. 2015 May 7. 10 (5):842-51. [Medline]. [Full Text]. Pareek G, Steele TH, Nakada SY. Urological intervention in patients with cystinuria is decreased with medical compliance. J Urol. 2005 Dec. 174(6):2250-2, discussion 2252. [Medline]. Daudon M, Cohen-Solal F, Barbey F, et al. Cystine crystal volume determination: a useful tool in the management of cystinuric patients. Urol Res. 2003 Jul. 31(3):207-11. [Medline]. Coe FL, Clark C, Parks JH, Asplin JR. Solid phase assay of urine cystine supersaturation in the presence of cystine binding drugs. J Urol. 2001 Aug. 166(2):688-93. [Medline]. Dolin DJ, Asplin JR, Flagel L, et al. Effect of cystine-binding thiol drugs on urinary cystine capacity in patients with cystinuria. J Endourol. 2005 Apr. 19(3):429-32. [Medline]. van Hoeve K, Vermeersch P, Regal L, Levtchenko E. Necessity of fractionated urine collection for monitoring patients with cystinuria. Clin Chem. 2011 May. 57(5):780-1. [Medline]. Sakhaee K, Poindexter JR, Pak CY. The spectrum of metabolic abnormalities in patients with cystine nephrolithiasis. J Urol. 1989 Apr. 141(4):819-21. [Medline]. Pontoni G, Rotondo F, Spagnuolo G, et al. Diagnosis and follow-up of cystinuria: use of proton magnetic resonance spectroscopy. Amino Acids. 2000. 19(2):469-76. [Medline]. Tiselius HG. New horizons in the management of patients with cystinuria. Curr Opin Urol. 2010 Mar. 20(2):169-73. [Medline]. Goldfarb DS. Potential pharmacologic treatments for cystinuria and for calcium stones associated with hyperuricosuria. Clin J Am Soc Nephrol. 2011 Aug. 6(8):2093-7. [Medline]. [Full Text]. [Guideline] Pearle MS, Goldfarb DS, Assimos DG, Curhan G, Denu-Ciocca CJ, Matlaga BR, et al. Medical management of kidney stones: AUA guideline. J Urol. 2014 Aug. 192 (2):316-24. [Medline]. [Full Text]. Koide T, Yamaguchi S, Utsonomiya M. A new therapeutic agent for cystinuria. VII International Symposium on Urolithiasis. Cairns, Australia. New York, NY: Plenum; 1992. 168. Bucillamine Phase 2 Trial in Patients With Cystinuria (NCT02942420). ClinicalTrials.gov. Available at https://clinicaltrials.gov/ct2/show/NCT02942420. May 18, 2017; Accessed: February 11, 2018. Goldfarb DS. Potential pharmacologic treatments for cystinuria and for calcium stones associated with hyperuricosuria. Clin J Am Soc Nephrol. 2011 Aug. 6(8):2093-7. [Medline]. Kachel TA, Vijan SR, Dretler SP. Endourological experience with cystine calculi and a treatment algorithm. J Urol. 1991 Jan. 145(1):25-8. [Medline]. Schmidt J, Madersbacher S, Hochreiter WW, et al. Simultaneous replacement of both ureters with small intestine in a woman with cystinuria. J Urol. 2001 Dec. 166(6):2315-6. [Medline]. Miyagi K, Nakada F, Ohshiro S. Effect of glutamine on cystine excretion in a patient with cystinuria. N Engl J Med. 1979 Jul 26. 301(4):196-8. [Medline]. Electron microscopic picture showing cystine crystals. Plain radiograph of the abdomen showing cystine staghorn stones. Faintly opaque (ground-glass appearance) left lower ureteric stone. Intravenous urogram showing left ureterohydronephrosis. Renal sonogram demonstrating renal calculi in the lower pole. Disclosure: Serve(d) as a speaker or a member of a speakers bureau for: Cook Medical; Olympus. Fast Five Quiz: Are You Prepared to Confront Gout? Rising Kidney Stone Incidence: Is This Novel Risk Factor the Reason?